Four British schoolboys had just been called from the classroom. They were ten days away from their A-level exams, the ones that determine the direction the rest of their lives would take, but they’d been interrupted from their studies to discuss the deepest secrets of the universe—their work hunting for the magnetic monopole at the Large Hadron Collider. Clearly, they would much rather be studying than be interviewed. The disinterested troop sat around a table in the back of a large science classroom outside of Canterbury. The teens, none older than 16, were discussing graduate-level physics. The basic equations for electromagnetism, the famous Maxwell equations, have an obvious blank that a monopole could fill. The equations with a magnetic charge, in other words, a monopole, would be symmetric with each magnetic term looking like the corresponding electric term. In other words, the equations would just look nicer. Given the collaboration’s small size, James Pinfold, the experiment’s spokesperson, and Dr. Becky Parker, director of the Institute for Research in Schools in the UK, thought it was the perfect chance to get secondary school-kids involved in high-energy physics experiments. Parker wants nothing more than to get her students’ names on a physics paper. Despite MoEDAL’s fancy acronym, it’s nothing like ATLAS or CMS the LHC’s famous, mansion-sized particle-detecting metal monsters. It seems like the perfect detector to staff with monopole-hunting teens. The experiment lives in a warehouse behind a McDonald’s, beside grassy fields and the wide Jura mountains. Its elevator has only two floors, 0 and -1, into a 300 foot pit. At the bottom, past the giant blue cylindrical corpse of a scrapped particle detector and beyond several yards of white concrete shielding is a vast, yellow-lit cavern, dominated by the LHCb experiment. That detector is a striped, 60-by-30 foot sideways pyramid to the left side of the particle collision point. On the right, up some metal stairs in a studio apartment-sized nook surrounding the point, the first thing you notice is a tiny blue LED on a circuit board connected to cables. That’s when you realize that the walls are tiled with flat rectangles of thick, translucent plastic bordered by aluminium bars. Each plastic sheet is labelled: MoEDAL. That’s it. A few walls covered in aluminium-lined plastic attached to a tiny silicon detector are tasked with discovering the magnetic monopole. 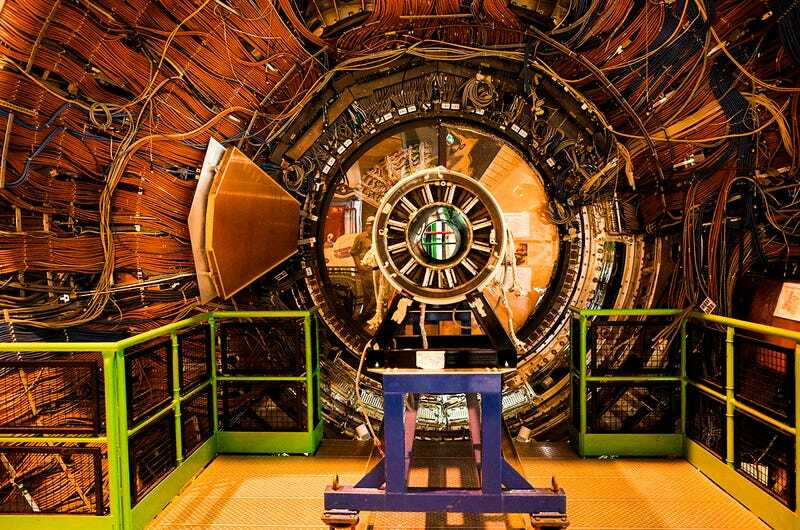 The CERN press officer was as surprised to see it as I—no journalist had planned a trip to see it in person before. The detector is simple because it does all it needs to do and no more. 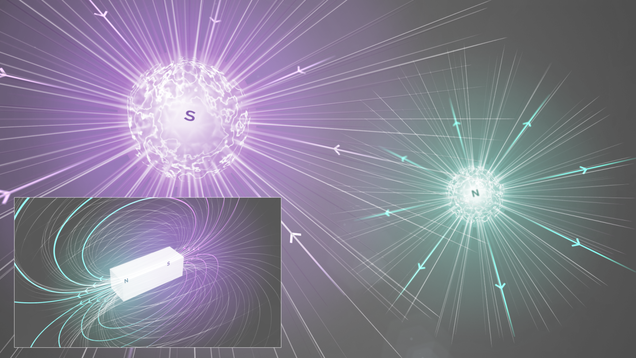 A monopole created from the energy of a pair of colliding protons might leave a visible trail in MoEDAL’s plastic “nuclear track detectors.” If you remember from high school physics, a regular two-poled magnet passing through a coiled wire will send a current through the wire one way, then the other way. A monopole passing through the aluminium bars should show a signature as if the current moved in one direction, but never moved back. As for the silicon pixel chip, the constant stream of debris resulting from the collisions can fog the plastic. 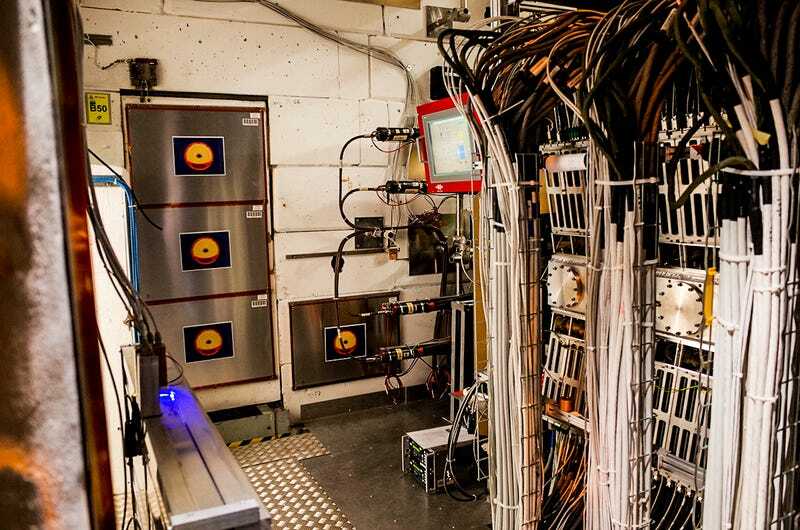 The state-of-the-art TimePix particle detector helps scientists best understand what background particles did the fogging so it’s easier to shield against them in the future. 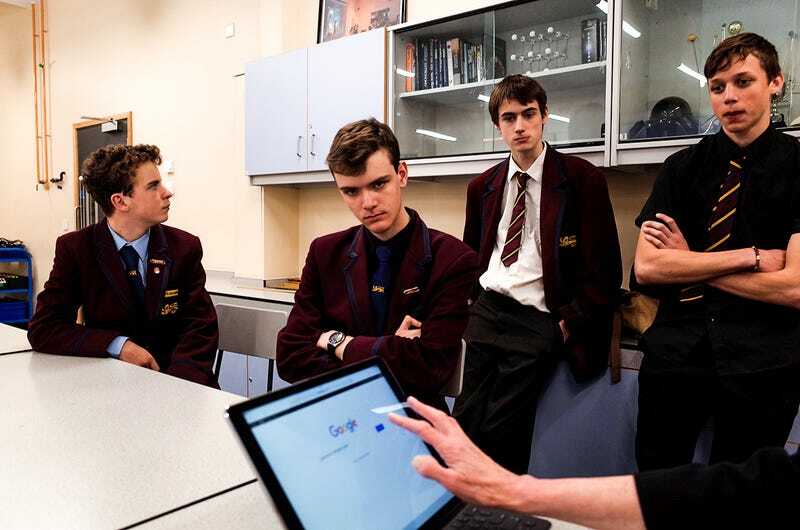 The students are part of the Institute for Research in Schools (IRIS) programme, letting teenagers take part in real science experiments, like those at CERN, the European Space Agency and NASA. Ever-cheerful Parker runs it with a curiosity, enthusiasm and excitability you could only wish every teenager possessed. After visiting the Langton during our driving tour of Canterbury, she pulled the car just to appreciate the blooming bluebells at the side of the road. She jogs the two steps from the door of her parked car to the parking meter. 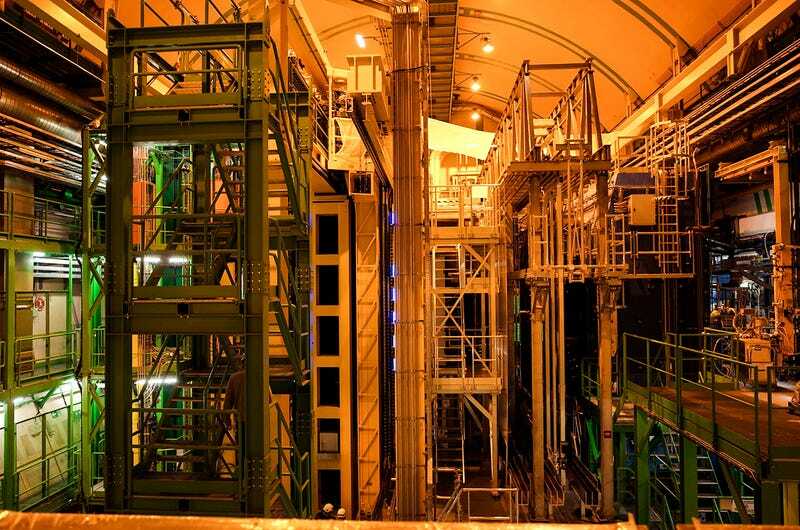 Their role quickly grew from identifying particles. Anna Evans has since graduated Langton and now attends the University of Manchester, but was on the MoEDAL team a few years ago. She and her team helped developed a citizen programme for other lay-people to help identify what the monopole might look like in the plastic. Her classmates soon became experts on the TimePix chip. They identified anomalies due to dead pixels. They wrote proposals to get more of the chips into the detector. They’d Skype into MoEDAL collaboration meetings. MoEDAL is still more than just the TimePix chip. Once the LHC run finishes and the MoEDAL team can retrieve their plastic, they’ll have to analyse it. 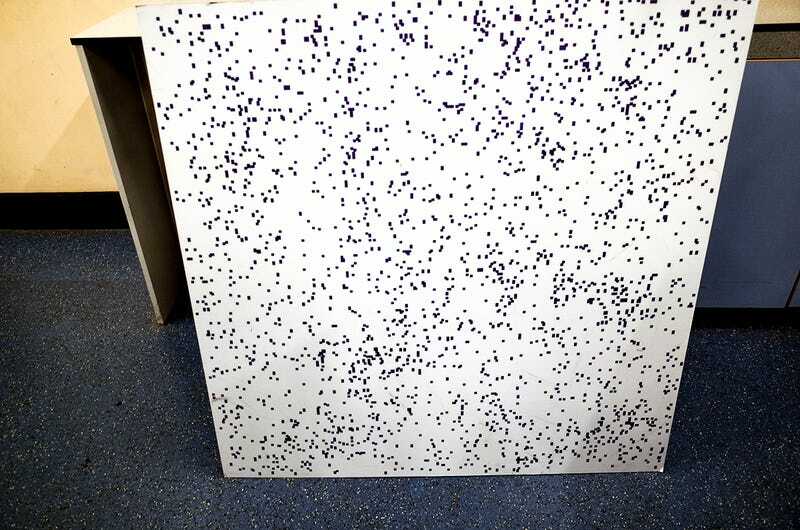 The plastic sheets head to a lab in Bologna where they’re treated with a potassium hydroxide or sodium hydroxide in alcohol solution, which would makes monopoles’ etchmarks visible under a microscope as cones in the plastic. The researchers can then do some form of automated scanning, or have citizen scientists, maybe the Langton students, look for the monopole. And if you gave them some time to prepare, there’s not really a limit to what sorts of tasks the kids can do. And the IRIS program is flourishing beyond just MoEDAL. Parker has introduced the programme to over 350 schools across the UK. Students are using data to optimise the Transport for London system. 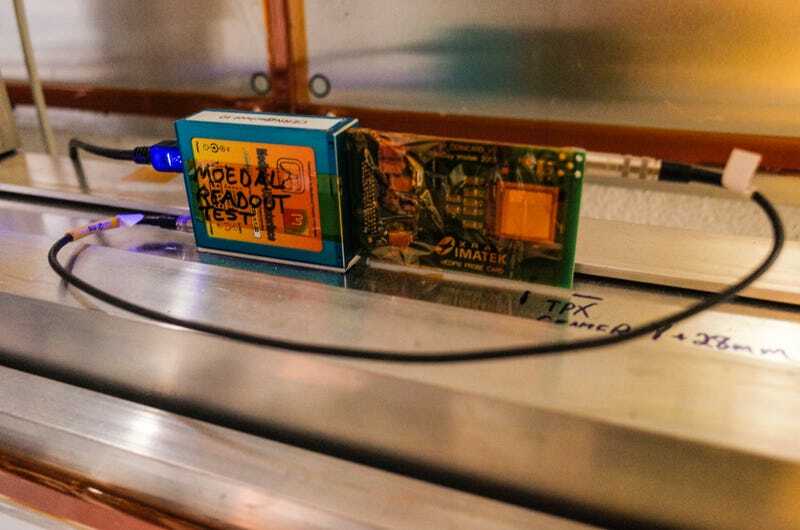 In fact, you might remember one student, Miles Soloman who found an error in NASA data earlier this year—he was part of the IRIS program at his own school, working on the TimPix project using the TimePix chip to monitor radiation levels onboard the International Space Station. The MoEDAL research is getting recognition, too—students including Evans presented their work at the Royal Society Summer Exhibition back in 2015.